Ballpark Basics: A typical ballpark with an atypical addition. Ballpark Breakdown: For a having a major league ballpark as iconic as Camden Yards, many of the Orioles’ minor league ballparks seem to come from the same regrettable blueprint; dropped off near a major highway in the middle of nowhere, surrounded by endless parking lots. 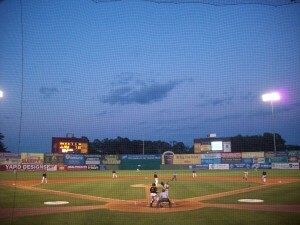 Perdue Stadium, home of the Delmarva Shorebirds fits this unfortunate mold and is situated near the intersection of Route 50 and Route 13 on the Eastern Shore of Maryland. (Geography Nerd Fact: The name Delmarva comes from taking three parts of the states’ names that make up the peninsula (DELeware, MARyland, and VirginiA). The stadium is named after Arthur Perdue, who founded Perdue Farms in Salisbury, Maryland back in 1920. Though the park is named after Arthur, it was his son, Frank, that led the way in getting the stadium built with not only financial help but also by donating the land for the stadium (they do acknowledge Frank’s generosity by naming the press box after him). Upon arrival, one would typically pick up their tickets, and then walk up a set of stairs which leads to the upper concourse. On this night with low attendance we were allowed instead to walked through the what is typically the VIP entrance; a set of double doors and down a hallway that leads you to the lower concourse. 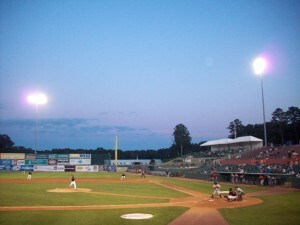 Here the ballpark opens to a similar layout to the home of the Frederick Keys or the Bowie Baysox. The seating bowl is divided by a walkway. The lower bowl consists of green seats with seatbacks while the seats in the upper bowl are bleacher style. Behind home plate the walkway opens up to a small concourse with additional food options. There is a nice wide concourse on the top of that was not really being used the night we visited and only about half of the concession stands on this level were open the night of our visit. (One of the workers in the team shop had mentioned that the crowds had gotten noticeably smaller since the Orioles latest pitching phenom Dylan Bundy had been recently promoted) However, the team store was on this level was still stocked with all the swag you would need. Another interesting aspect on this level is the Hardball Café, a seating area on the upper concourse behind home plate that had hi-top tables and a great view of the action. Unfortunately this was also closed on the night we attended. Down the right field line there are picnic tables lined up so you can watch the game in a group setting without any hassles. Down in the left field corner of the concourse is where you will find the kids area with inflatable games as well as a carousel; again this is similar to their sister ballpark in Frederick. While many of the Orioles’ farm teams play in these similar ballparks with unfortunate blueprints, there is another area in which they are similar and it isn’t such a bad thing – the craft beer department. 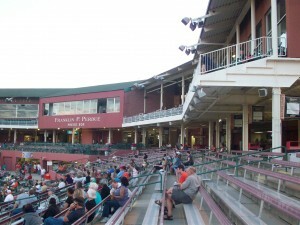 At Perdue Stadium you have multiple options if you are looking for local beers. The options include the Evolution Brewing Company from just down the street as well as 16 Mile Brewing, Eastern Shore Brewing and Dogfish Head. Another plus for this ballpark is the beach. The Atlantic Ocean is just a short drive and the laid back attitude creeps into the ballpark’s atmosphere. You will see quite a few sunburned families taking in a game after a long day on the water. However, there are just as many locals that follow the team and root passionately for the home team (most with considerably less sunburn). But walk back through the hallway that we initially entered to find the real jewel of this place. The Eastern Shore Hall of Fame. With jerseys, baseballs, photographs, various memorabilia and friendly staff, it is hard to top this as a minor league hall of fame. Hopefully you will be lucky enough to be there on a night that Teddy Evans is volunteering. The man has an incredible memory and can tell a story and give you all the information you would want about the history of baseball on the Eastern Shore (which is quite impressive). Jim ended up spending more time in the Hall of Fame than at the actual game. 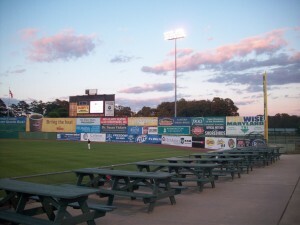 In the end, taking in a game at Perdue Stadium is just like many others. You have a typical minor league ballpark with a typical layout. However, the relaxed atmosphere paired with the multiple craft beer options make this an enjoyable place to take in a game. 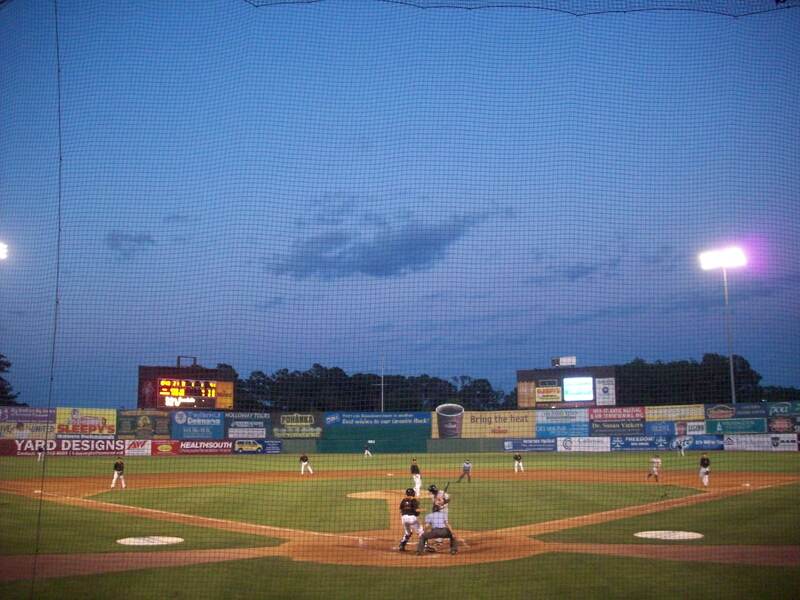 Adding in the fact that it houses the Eastern Shore Hall of Fame makes it worth a trip here all by itself; and with the Atlantic Ocean just a half an hour away, if you like baseball, beer (and the beach) then Perdue Stadium is definitely worth a visit. 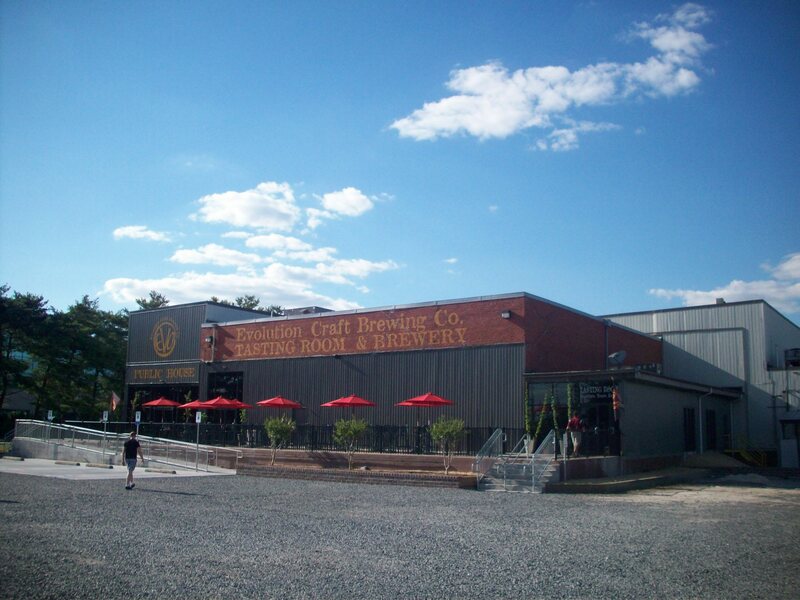 Brew Basics: A brewery with a split personality. Evo first opened in 2009 quickly found success, and began looking for a larger space. First settling on (and purchasing) an old railroad station in downtown Salisbury, MD, they suddenly found themselves in a battle with the city who didn’t want to share their water. The issue apparently could not be resolved, for though they still own the RR building, they aren’t housed there. 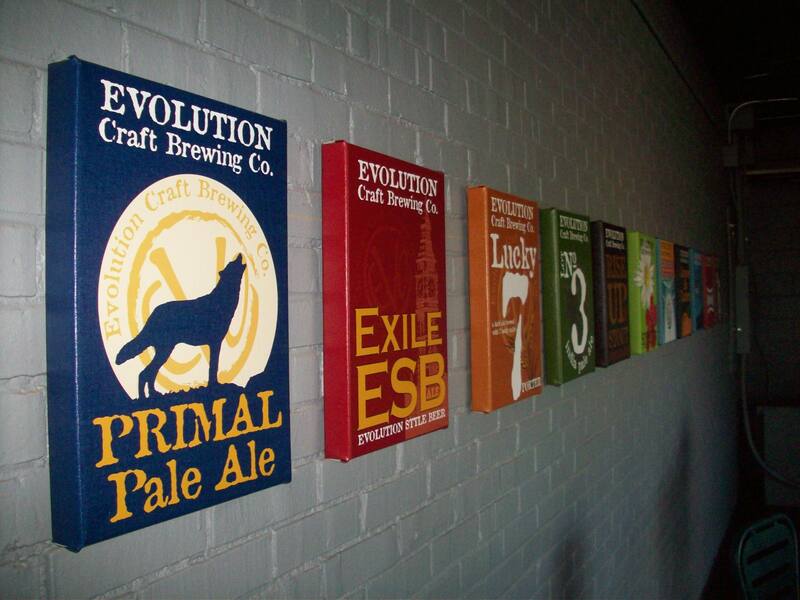 Instead, Evo has moved into an old ice factory; which houses a full service restaurant, tasting room, the entire brew works, and still leaves them room to grow. First, let’s go right. The tasting room is mainly made up of a skinny bar that begins on your left just as you walk in. Long, light wood with a high shine, the most interesting feature may be the wrought iron rectangle suspended from the ceiling. Running the length of the bar, votive holders are spaced just a few inches apart, creating a neat atmosphere and a headache for the bartender, as they must climb up to individually light each candle. 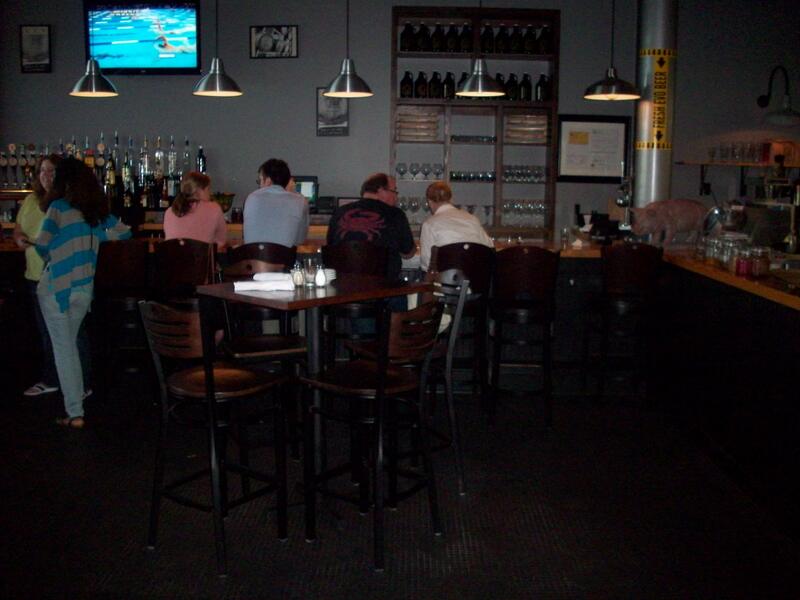 Most of the seating is along the bar, although there are a handful of bar top tables. The rest of the narrow space serves as barrel storage for their soon-to-be sour beer series. The atmosphere is nice, but laid back. Amiable bartender, casual conversation, reasonable prices; merchandise is sold, growlers are filled, questions from visiting reviewers are answered. To get to the other side, you can head back outside or just slip through a set of sliding doors left over from the ice factory days. Either way, you enter another world. Contrary to the casual , friendly vibe of the tasting bar, the larger restaurant area exudes self-importance. The food is equally pretentious and definitely overpriced, the dress code is nicer, the décor is a bit more high-end. A large chalkboard mounted to an exposed brick wall lists their beers in a small section, along with the days’ charcuterie choices and high end cheeses. Water from the onsite well (thus solving the water sharing problem mentioned earlier) is poured out of recycled Patron bottles instead of being piped through the bar. The bartenders on this side were pretty girls who didn’t have much of an interest in talking to us. This makes it a great spot for a nice date night perhaps, but not for grabbing a quick bite and a good beer. Brew Breakdown: A perfect example of the difference between the two rooms is with the flights. We had two – one in each room. No specialty beers are allowed to be poured for a flight, so all the beers were “equal” yet the one in the tasting room cost $5.00 while the one in the restaurant cost $9. We asked the bartender on the restaurant side about the difference, and her answer was simply “I don’t know, that’s just how much it costs”. Compared to other places we’ve been, five dollars seemed much more reasonable for the size of pours (you only get four 3oz samples). Grabbing one from each side allowed us to sample most everything they had on tap that night for with everything written above, there is one big reason to sit on the restaurant even if you’re not in the mood for a pricier night out – the tasting room has roughly a half dozen beers on tap, while the restaurant has those six plus all the specialties, seasonals and more. Summer Session (4.6 ABV, 25 IBU) – Bright pale yellow with lots of thin white head and light lemony smell. Despite a thin mouth feel, the citrus malts, rye and a touch of hops in the swallow gave it a surprisingly strong tart flavor that was almost sour. Evo Prelude Red (5.5) Dark mahogany color with ring of lace. The Prelude has a strong aroma of anise and raisin, but the taste was caramel, carbonated and just a little sweet. This beer was flavorful without having as strong a flavor as the Summer Session. Lot #6 DIPA(9.3 ABV, 75 IBU) Floral hop aroma that poured the color of iced tea with a long lasting lace. Light flavor, strong hops in both palate and after taste, so a fairly consistent beer that started hoppy, and ended hoppy. Good. Rise Up Stout (??) – Caribbean style infused with local beans (from Rise Up) that were put in left over barrels to make a limited edition beer with vanilla beans and cacao. Dark – almost black in color with a coffee smell so strong it blocks all other aromas. Satisfying and well rounded, and not too heavy to drink on a warm day. Lucky 7 ESB – Dark but more of a chocolate brown than the black of the Rise Up. Still comparing it to the stout, it had coffee notes, but not as many and this one was a bit smoky. Chocolate taste first, followed by the smoke which was mainly in the swallow. Overall, Lucky 7 had a thicker consistency, but lighter flavor. Primal Pale Ale (5.0 ABV, 30 IBU) – Another sour beer, like the Summer but more golden in color – like a lager. The Primal has earthy pine and citrus notes with definite hops, all of which come through in the sip. A slightly drier beer. Exile ESB (5.9 ABV, 48 IBU) A pretty toffee hued beer that smelled like spicy flowers but was actually very bitter. Gillian’s least favorite of the day (although the sour ones weren’t high on her list either). Lot 3 IPA (6.8 ABV, 65 IBU) Almost the color of the ESB, but slightly lighter and more of an ambery yellow than a golden. *ok so maybe not the same as the ESB….with lacing that stuck to the sides of the glass and never gave up. Lot 3 is slightly fruity, slightly floral and carried a good hoppy bouquet. Tingly carbonated but delicious. Overall IPAs really seem to be EVO’s strong suit.